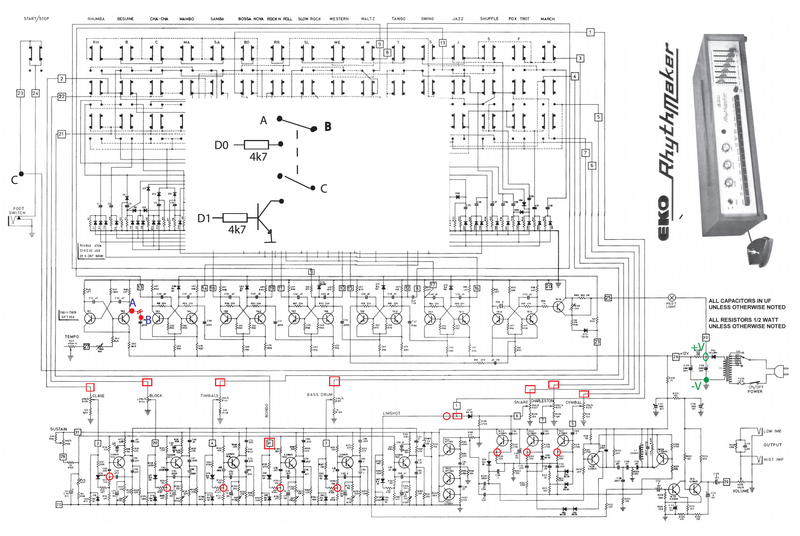 This schematic shows trigger points and clock injection points for EKO Rhythm Maker to be used with uniPulse. To our knowledge this has not been tested yet, if you have, please let us know. Trigger points are marked in two variants: rectangular are before the volume control, round after the volume control. In case of the LIMSHOT (sic.) there is no volume control so points are the same. Configure uniPulse to use positive trigger. in order to use clock sync, you will have to remove one leg of C35 so create separate points A and B. Use a two-pole switch and wire it up to points A, B and C. Connect D0 output from unipulse to one side of the switch using a 4k7 resistor. Connect D1 output from uniPulse to a generic NPN Transistor unsing a 4k7 resistor. (As shown in the middle of the graphic). If you configure D0 as clock output and D1 as start/stop you can use the switch to select between internal clock and midi clock. Power for uniPulse is marked in green as +V and -V. Voltage at +V might not be high enough for the uniPulse in which case you could use a separate power supply for uniPulse. If you have measured the voltage at +V point, please let us know, so we can correct this paragraph.